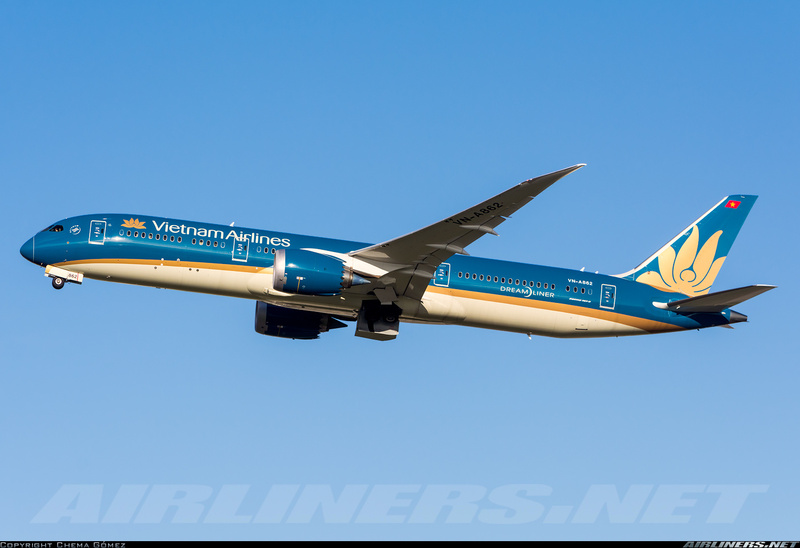 Welcome to my Trip Report on Vietnam Airlines 787 Dreamliner! This is the airline's Airbus A350, can you see the difference? Since I had ample time at Ho Chi Minh City, I decided to do a joyride on the domestic flight. 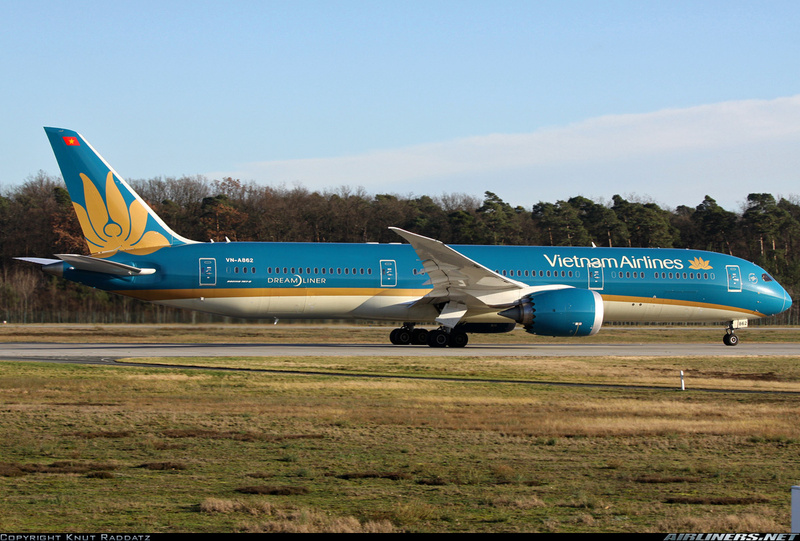 I considered flying either Vasco ATR-72 or Vietnam Airlines Boeing 787-9 Dreamliner. Since I had already flown on the airline's A350-900 (part 1 and part 2), I thought I should fly the 787-9 on the same route, both ways as well to do a comparison between both aircraft. Once that was decided, I went to make my booking. For information on the website, you can check it out on my part 1. I found a good fare for the one day return trip - U.S$100 for the 4 hours flight on the Dreamliner, what a bargain. Between the Airbus A350 and Boeing 787-9 Dreamliner? I prefer the Boeing 787-9 for its exterior and interior. A350 is a good plane from Airbus - its main advantage over the 787 is the cabin noise and roomier cabin space for the Y class 3-3-3 seating configuration. 24 hours before flight, you can do your on-line check in. Premium Economy class seats are sold at Economy Class airfares and usually are taken up fast. The lowest fare usually can't get the better seats. Looking at the seat map, it was indeed the Boeing 787's seating configuration. The last thing I want is an aircraft change to Airbus A321. I had a chance to fly on the premium economy class, but I didn't want the middle seat. The 2nd cabin was mostly vacant at this point. I chose seat 33A, the same seat number as my A350 flight to Hanoi. Check in completed and I just had to count down the hours. If you check in at the airport, you can avoid the long queues as there is a separate check-in counters of web check in and passengers with no baggage. Later on during the day, I tried to do the check-in for the return flight, but no matter how many times I tried, it didn't work. That means I had to do the check in at Hanoi Airport. The worrying part is that my aircraft gets changed to something else! I got out of my hotel around 8.30 and made my way there by taxi. The ride took around 15 minutes to the domestic terminal. Most Vietnamese understand basic English so if they don't just show them the address in Vietnamese and they would take you there. Once at the airport, I went to do the check in. I made my way to the domestic departure. This is the self check-in kiosk. I prefer to get the boarding pass, so I made my way to the counter. The queue is pretty long! Most of them were flying to Hanoi on the earlier flights. The staff asked whether I wanted to transfer to an earlier flight which was operated by Boeing 777-200ER. I declined and preferred to stick to my original flight which was still scheduled to be operated by Boeing 787. The airline's Boeing 777, I have plans to do it in the near future. Got my boarding pass and I am surprised that I was 6th in the queue. My flight was delayed for what I believed was a technical problem with the Boeing 787 Dreamliner. Both A-862 and A-864 were at Hanoi Airport when I did some checking at the hotel early that morning. One of them had to fly over soon otherwise my flight would either be delayed or aircraft change to something else. Thanks to Flightradar24, VN-A862 was my ride to Hanoi. She was on her way while I was at the air side waiting for her arrival. During the period, I logged into the airport's wifi and you have to answer 2 questions before being able to access the internet. Connection was fast and smooth, had no issues with it. Going through security checks was fast and I was soon at the air side. I like the spacious layout of the air side, doing a bit of walking does you some good. Only thing is photography of aircraft is difficult but not impossible. There are a good selection of eating places, but I decided to grab some donuts at Durkin Donuts. Gotten myself a couple of donuts and a drink! Choice of donuts is not as many as the outlets in Kuala Lumpur and Singapore. I hope to use the airline's lounge in the near future. The departure gate - announcement was made regarding my flight's delay due to the late arrival of the aircraft. I was not surprised at all. As long as I get my 787 Dreamliner ride, and the delay doesn't affect my return flight, I am all good. Looking at the crowd at the gate, I wasn't surprised my flight was full. Queues were formed but the staff told us to come back later. However, no one moved and we waited for another 15 minutes before boarding commerced. Boarding the aircraft was organised as passengers were made to queue up to board the aircraft. Business class and passengers with families and needed assistance got to board first, the airport staff had done well in this aspect. Once that's settled, the rest of us could board. Greeted by the not-so-enthusiastic crew once again, I made my way to my seat. Service on Vietnam Airlines especially in Economy Class can certainly be improved. 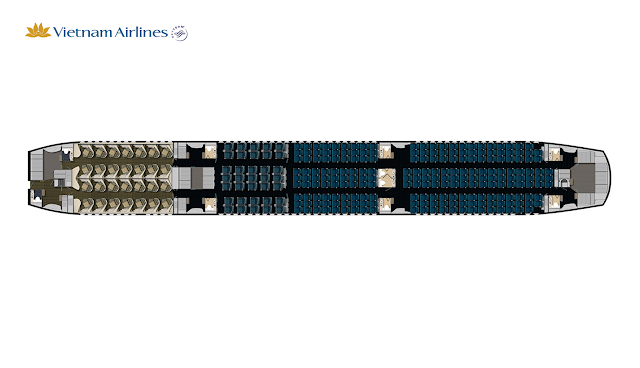 This business class product features 1-2-1 seating configuration in a herringbone layout across 7 rows. One advantage of this configuration is passengers get to choose between sitting alone or with a partner. The remote control, seat adjustment control and reading lamp are conventionally located at the side. Looks pretty spacious especially for those sitting near the window. The cleaner had started cleaning up to prepare the cabin for the next flight. One day, I had to try this seat. At least if you are sitting with a stranger, there is some privacy. This is configured in 2-3-2 for better legroom space and width. Very suitable for medium-long haul flights. Do note that one of the seat was broken. Good legroom space and have a bit more premium feeling to it. The IFE system is stored in the hand rest area. No one wants to sit in the middle! I had a chance to sit at the last row middle seat, but I rather have the Window seat near the rear. Other than the width of the seat and legroom space in each row, the seat itself is similar to the Economy Class. The location of the remote control is better placed. One would think that is this a Low Cost Carrier! Somehow the back of the seat reminds me of Scoot's Scootbiz class. The width of the seat is very much noticeable when comparing to the Economy Class seat. I gave this seat a try after the flight and yes its worth paying more for this seat. Comparing this to the first batch of A350s (VN-A886 to VN-A889), this premium economy class cabin product is better. 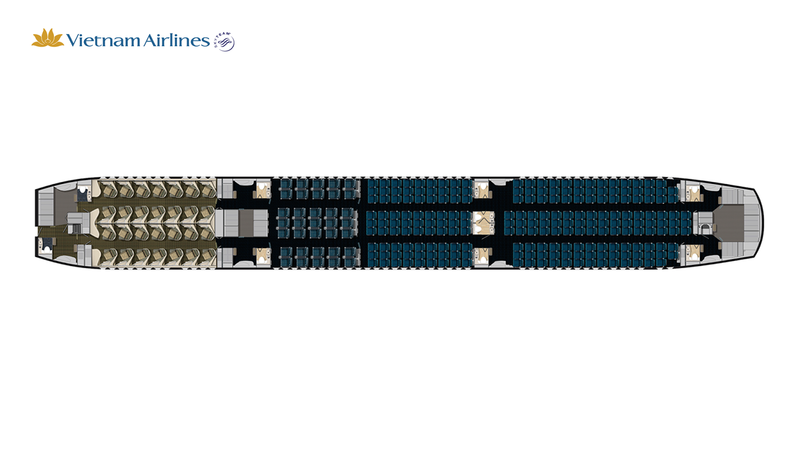 3-3-3 seating configuration which is standard among the 787 operators. These seats are similar to the A350's. There are a few minor differences such as remote control at the hand rest area (similar to Scoot) and the In Flight Individual TV is smaller. The smaller IFE screens compared to the Airbus A350, but is still an improvement over the Airbus A330 and Boeing 777. The middle seat at each row may be squeezy depending on the size of your seat mate. Its good to enter the cabin early, get your stuff up the overhead bin and settle down before your seat mates appear. Emergency row seats offer very good legroom space but you have to pay a price for it especially on wide-bodies. Are you a fan of the electronic dimmed windows? I am. Legroom space is slightly better than the A350's. As usual, windowless seats are spotted. I won't be too happy if I had gotten myself one. Cabin view of the Economy Class during flight. The electronic dimmed windows were not controlled by the crew. On my return flight, I sat at this last row 2-seater, aisle seat. Remote control buttons at the side buttons and this triggered crew calls quite a number of times but the cabin crew ignored them! Size at the rear is similar to the A350's toilet. Price is pretty decent for the short flight, but I didn't use it. This is the reason why. Not worth it since I can't post photos in twitter and Facebook. IFE screen is smaller than Airbus A350's. The IFE system works fine for me, user-friendly, however I don't like the remote control to be at the hand rest area. Contents are the same as the Airbus A350's. This is the A350's IFE system, I prefer the remote control to be below the IFE screen. I had a choice between Fish and Chicken, I chose the latter. Its pretty tasty. I had Coke for my drink. It was great to be able to do the Boeing 787 Dreamliner trip on my 3rd domestic flight with this airline, I was relieved that the aircraft didn't change to something else. Once on board, I made my way to the seat. For me I like boarding early as I could take as many photos as I can. Once again, the flight was almost full and had the 2 seats beside mine taken up so I would only get up once to explore the cabin during the flight and that's it. Apology from the crew for the delay but no explanation was given and we pushed back 14 minutes after the original schedule departure time. Announcement was made by a female crew and she apparently got the aircraft type mixed up, that was corrected by the flight crew who came online later. "Welcome on board the Boeing 777.. pause, Boeing 787-200" I was probably one of the few on board smiling. Unlike my A350 flights, the IFE system was not in operation not just for this flight, for the return flight as well. I find it to be quite strange and many other passengers were puzzled as well as they kept trying to get their IFE system going. It was stuck at the 'Welcome On Board' page. Well, if you want to promote your airline's new aircraft, you have to let the passengers enjoy it. Never mind about the earpiece but at least let us use it. I guess is they want to ensure they are working when the aircraft flies on the next long haul flight. We taxied to the runway and stayed there for around 4 minutes (no explanation) and finally took off at 1301. While taking the video of the take off, there were quite a bit of bumps before climbing out Ho Chi Minh City, only then we had smooth air and for the rest of the trip, there were minor bumps but nothing bad. Seat belt sign was kept off for most parts of it until landing time. Cabin crew came around and served us lunch, they should make themselves more approachable with smiles on their faces to make the flight more enjoyable for the passengers. Happy passengers mean more likely they return and may recommend the airline to others! Since the IFE system wasn't working, I watched the world passing by and also dozed off for a while. I did a walk round in the Economy Class cabin before heading back to my seat and enjoy the rest of the flight. It was a great ride on my 20th 787 Dreamliner trip. More to come, definitely. Once the aircraft touched down, we taxied to a remote parking lot. I was happy about it as I managed to take quite a number of decent shots and no one stopped me, I guess as long as you are not holding up the passengers behind you. This set of crew was seen packing up as their duty had ended. My aircraft was parked beside this Airbus A330-200 in 'Skyteam' livery and this aircraft did a few round trips from Ho Chi Minh City to Hanoi. Aircraft pushed back with engines start up, we started taxiing to the assigned runway. Spotted EVA Air's Boeing 747-400. Passing by this ATR-72 aircraft operated by Vasco. Take off video - we waited for about 4 minutes at the runway before taking off, no idea why. The Boeing 787 Dreamliner aircraft always impresses me with its flying performance. Take off cabin noise isn't significantly louder than the A350. Soon it was time to descend, the flight crew updated us of the weather and once it again I would be arriving in cloudy condition. Out of the clouds but this isn't the weather I like, would very much prefer to see sunny Hanoi! Landing was smooth and there wasn't much traffic at that time so from landing to the remote parking lot was quick. Weather looks dreadful at this moment, surprisingly it didn't rain. The blank white Airbus A320 aircraft is Vietjetair's leased aircraft. Parked at this lot and the mini bus is for the Business Class passengers. I was one of the last passengers to get off the aircraft and I had quite a bit of time to snap these photos as an elderly gentleman was walking down the staircase slowly. 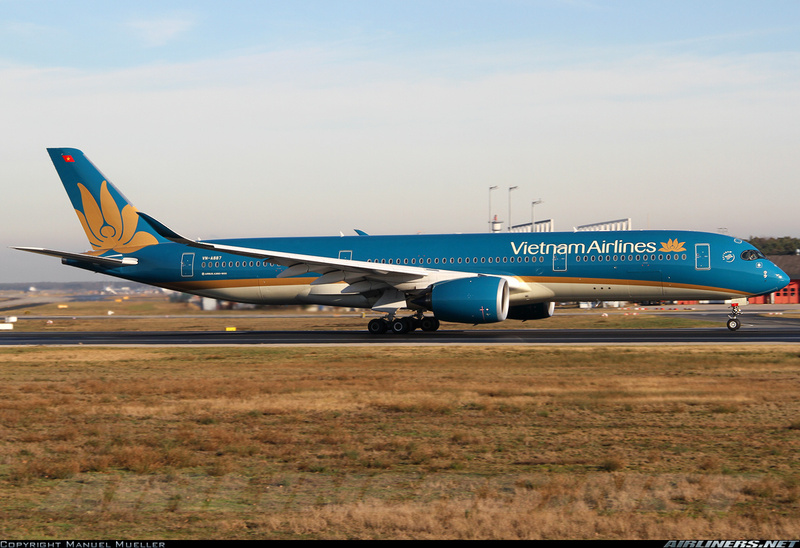 Thanks for the ride, VN-A862! The airline has pretty decent new products in the Economy, Premium Economy and Business Class and with the Airbus A350 and Boeing 787-9 now in operation, the airline can phrase out the older aircraft type, the Airbus A330-200 and Boeing 777-200ER which have played a significant role to the airline's history. For now, one by one the older generation aircraft are returning to the leasing companies, the same rate as the new aircraft entering the fleet. So for those who book themselves on flights scheduled to be operated by the new generation jets, sometimes aircraft change can take place due to operation reasons, don't be disappointed. The disappointment of this flight has to be the in-flight service and the non-functional In-Flight Entertainment system but it was a short flight so it doesn't matter. I would definitely recommend anyone to do the joyrides on these new aircraft, its the cheapest way to do so. 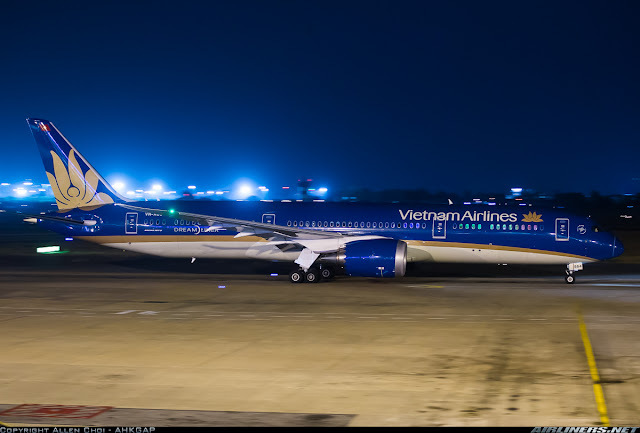 The A350 and B787-9 aircraft are scheduled to operate on Ho Chi Minh to Hanoi sector on different flights each day on a permanent basis.